Shift, by its own merits, is not at all a poor game. It's simply torn between two worlds. Need for Speed: Shift is the 13th instalment of the long-running racing video game franchise Need for Speed published by Electronic Arts. It was announced in January 2009 as part of a three-game announcement that includes Need for Speed: Nitro and Need for Speed: World Online. Shift was developed by Slightly Mad Studios—who previously helped develop much more simulation-based titles such as GT Legends and GTR 2 together with SimBin Studios. In the new franchising model for the series adopted by EA, Shift takes its place focusing on simulation racing and realistic drifting rather than the arcade racing of previous titles in the series. It abandons the street racing formula of previous games and focuses on simulating the "true" driver experience, in the process risking the loss of it’s dedicated fan base. In all honesty, Shift comes across as yet another game from the sim based lineup of GTR2 and Race07, and there are many similarities to those games. I feel that Shift is simply taking a modified GTR2, simplifying the controls and physics to a more arcade driving style, and slapping the Need for Speed logo on the cover. While this doesn’t mean that the game is anywhere below average, it just seems like a mismatch of title and content. Fans of racing sims may dismiss the game outright because Need for Speed was never known for being anything other than arcade, whereas fans of the series will find themselves struggling through the career mode due to Shift’s much increased difficulty. The first thing you will notice when you start on your career is that there isn’t much of a story. In fact, you are a nameless driver who starts out low and wishes to make his way to the top with Shift World Series competition. There are no characters or personalities, other drivers are nothing more than names on the scoreboard. So right off the bat, this may cause some fans of the latest NFS series games to struggle being interested in career mode. However, if you were a NFS fan during the 90’s when the game also lacked any kind of story or personalities, you’ll be alright. 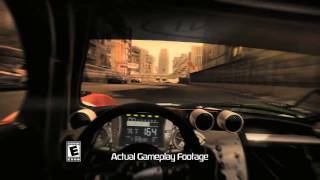 Things start off with a practice lap, where fans of NFS will get their first taste of the brutal difficulty of the game (compared to the series usual arcade). You must use the break a lot, turns must be precise and smooth, because sharp turns of the wheel will send you sliding out of control at higher speeds. Due to this, I wouldn’t be surprised if most fans of NFS will set the sliders to “Easy” so they can actually enjoy Shift’s driving model. In the other camp we have the Sim driving fans, who will appreciate the driving mechanics, but at the same time find glaring inconsistencies and overcompensation in components such as turning, accelerating and drifting. You see, the issue with NFS Shift is that it tries a little too hard to appeal to both camps – and ends up not being very good for either. Arcade fans will find the game too challenging, and a lack of a story will provide little motivation to keep going. Sim fans will find that the engine overcompensates in driving mechanics such as sensitivity in order to be a more difficult, rather than being realistic, simulator. Shift also suffers from robotic, rubber band AI – during group races, a huge gap always forms between the top 3 cars and the rest of the pack. So if you are unlucky enough to be 4th, you can forget about catching a podium place if you are more than a second behind. On the other hand, if you are able to make it to first, you can pretty much keep the rest of the drivers behind you the whole time – but if someone passes you, they are suddenly granted some kind of super boost and speed away in a much less upgraded car. The one on one races provide similar frustrations, as you will easily win the race if you can keep your opponent from overtaking you. But if you let them slip past, you have no chance of catching them again (Even on easiest difficulty). Sure, as the game advertises, the AI drivers make mistakes and allow the rest to pass them, however I’ve only had this happen early in the race when there were no clear winners yet. Once the pack forms into the “3-gap-the rest” formation, the top 3 never made a mistake in the 50+ group races I’ve played through.